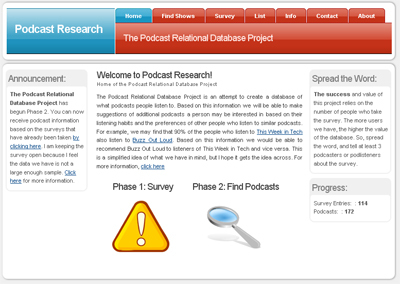 Well, I've finally decided to move my Podcast Research webpage into "Phase 2." What this means is that you can now select a podcast in the database that you like and see recommendations for other podcasts from people with similar interests. Now, I'm not very confident in the data coming out of this system right now because the number of people who have filled out the survey thus far is nowhere near what I had hoped for. I was shooting for 500, and as of now only 114 surveys have been filled out. The other problem is that just about all those people who filled out the survey came from MyExtralife.com and as a result the surveys are a little skewed towards Scott's podcasts. Now, this is okay with me because I like Scott's shows, but I don't think it is good for the "Podcast Relational Database Project." I originally planned on pulling down the survey when I moved to Phase 2, but because I didn't get the response I wanted I'm going to leave it up for now. Hopefully, the fact that I have delivered something will entice more people to want to contribute to the cause. If you haven't filled out the survey yet, and you listen to podcasts, I would highly encourage you to please go fill out the survey. If you have already filled out the survey and are looking for podcast advice, go ahead and check out the first deliverable from PodcastResearch.org. I would also appreciate it if you tell other people about the website and encourage them to fill out the survey. the more people who fill it out, the more valuable it gets. Once I start getting more submissions I will start development on the second part of Phase 2: user accounts. The full functionality of this hasn't fully formed in my head yet, but what I'm thinking is that you will be able to login and adjust what shows you listen to and get recommendations that are not just based on one show. I am also considering setting it up so that you will have a one stop shop to see when shows you listen to are updated (a master RSS feed? ), and maybe even setup a community where you can suggest shows to other users. Another thought I had was that you may be able to sign up for a periodic e-mail that would let you know when a new show was added to the site that fits your profile. I really think that if people are interested and use this site that it could become a neat and powerful tool. It's great to see your work and its development. Thank you! I'd just recommend that you give something in return to people who take the survey, say an "immediate" membership to your website.